love, life, holiness, purity, joy and is the eternal dwelling place of God and those who belong to Him. We are called to set our minds on things above, not on things of this earth. 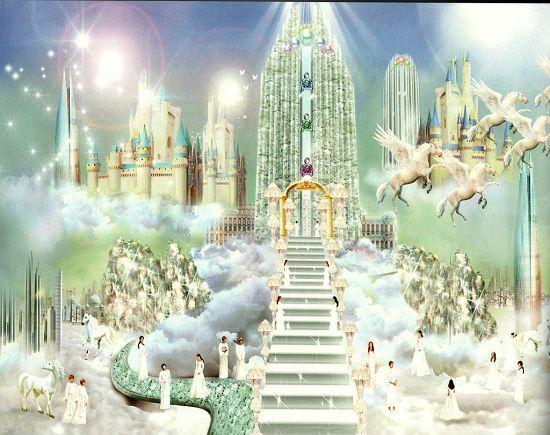 This page has divine revelations and prophetic visions from the Lord regarding Heaven. More will be added to the page over time. Ian McCormack died from 5 box jelly fish stings and had a 15 minute near death experience in which he had a brief experience of Hell, and saw the Lord Jesus Christ and a glimpse of Heaven. This has changed the life of many (including me many years ago!). – living pleasing to God and Much More. Its just over 2hours long, but worth watching. Set aside a time to watch it. In May 2006, a servant of God named Brani Duyan from Malaysia, was brought to Heaven to meet with the Lord Jesus and receive a revelation of 6 messages for the church. Brani, 52, has served in the church as an Elder & Pastor. He died of a stroke and was taken by an Angel to Heaven, and saw the Lord Jesus Christ. Here is his testimony of the 6 messages he was told to convey to the whole church. Take heed ……. Jesus had messages for me to bring to Earth. He wanted me to tell these messages to the children of God on Earth. “These messages are VERY IMPORTANT for them to know”, said Jesus. I was told that I would be very busy getting out these messages. Jesus also wanted me to share my Heavenly experiences to all the children of God so they will be blessed and renew their strength to follow Him. “Tell My children, they must Believe in Me with All their heart, their strength, and their mind. Those who are worried and doubtful will not get in here,” said the Lord Jesus. “Tell My children, they must be obedient to give Tithes and Offerings,” said the Lord Jesus. “Tell My children, they must put in Prayer all their wealth to Me for protection and blessing while they are still on Earth, so that when I come to Earth for the second time, they will not be attached to their Earthly wealth. Remember the story of Lot wife,” said the Lord Jesus. While Jesus told me the sixth message, He showed me the sky, it was all clear and no clouds. I saw Jesus opened His hands to Earth and He spoke “I am ready to take My children.” Then I saw many people in white robes flying up in the sky to meet Jesus. They were gathered to the left and right side of Jesus. Many people who believe in Jesus were ruptured. Moreover, I saw all members of many families were being ruptured. I could see the husband and wife with their children flying up towards Jesus. I felt so peaceful to see this sight. Then Jesus insisted, “look down”. Jesus then showed me the situation on Earth, it was very chaotic. There was no peace on Earth during that time. I saw people were running all over the place and shouting. Parents were looking for their children and youths were looking for their parents. Jesus showed me the Church in my hometown. I felt so sad, because there were some people who were left behind. Then the Angel took me to Earth on the same horse we rode before. We got to Earth very fast. Then the Angel took me back to the hospital. While I was looking at my earthly body, my spirit immediately went back into it. I noticed that my body had fully recovered from the sickness. Praise God for His power! I remember that when I was in Heaven my body looked like as it did when I was young. That is my testimony of meeting with the Lord Jesus in Heaven. Around 8am, as I was on my bed, GOD opened my spiritual eyes and took me into a vision, in the spirit HE took me to Heaven. The place I found myself standing, it was paradise of GOD, I saw stupendous mountains, hills, very high water falls, with clear sparkling water, there were so many of this waterfalls, I could hear the sounds of waters falling from the heights , there were beautiful colorful flowers growing everywhere, I saw extremely green grass, forest of trees, full of life and vibrancy, nature, just going as far as the eye could see, when I looked at the atmosphere, it was exhilarating with light, the light I saw was mostly golden, golden light, the glory of GOD seen from everywhere, the scenery was so beautiful, colorful and full of glory. I felt so much peace, joy and the love of GOD, then I saw a bird, it looked more like a dove, but it was a bit transparent and golden, so beautiful, I remember I was so thrilled, I looked and admired it; it flew across the skies of heaven, from west to the east. Then I was lifted to another place in heaven, Then as I looked towards a certain place, there were golden structures, I was given a revelation that gold is one of the major colors in Heaven. Also most structures, equipments, buildings etc are made of gold; it was so beautiful to see gold everywhere in that world of Heaven. The gold of heaven is so pure and beautiful. Heaven is the most beautiful and colorful place. You don’t want to miss it. LIVE FOR JESUS, ALL FOR JESUS !! Sarah, is there a way you could help us settle this matter. You look good: with artificial hair and earrings. Many Hell and heaven testimonies say that people with earrings and wigs are not allowed to enter heaven. If this is so, Jesus would not have taken you to Heaven. we are confused and don’t even know how to manage our hair again because these many testimonies claiming that people with jewelries never enter heaven. Help us resolve this issue please. I believe Jesus His Majesty The Christ is the very glory, splendor, light and beauty of Heaven and the very opposite of Hell. thank you for the good Ministry you are doing to God. Came across this site by chance while looking for something else. It has helped alot. Is it possible to register and subscribe for updates? Thank you Lord Jesus for being so merciful with me and for leading and guiding me all these years when I was lost and wandering not knowing what to do next. Thank you Lord Jesus for all that you have done in my life thus far and all that you are going to do for me to the very end. I love you Lord from the bottom of my heart and please help me to obey all your instructions and teachings and to be faithful in pray. Thank you Jesus for having suffered and died for all my sins on the cross and for forgiving me and cleaning me of all my sins. Through all the testing times, though hard and long , may I abide in Thee – steadfast and strong .